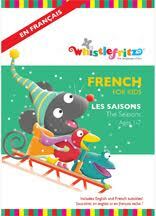 French for Kids: Les Saisons (The Seasons) is a fun, colorful DVD language course from Whistlefritz that is perfect for helping your kids learn French. Les Saisons follows Fritzi, a cute and cheery mouse who attends a birthday party and then wonders when his own birthday is. His friend Marie helps guide him through the year and tells him all the special traits of winter, spring, summer and fall so he can figure it out. I had fun joining Marie and Fritzi in a well-paced lesson and jovial sing-a-long about the seasons – all in French. The entire program runs 35 minutes and, while it’s about the seasons, it also covers vocabulary on saying “hi,” saying your name and other basic phrases as well as special vocabulary about holidays. This program really helps children understand by repeating words over and over and singing about the words to make it fun. The teacher Marie pronounces everything very slowly and clearly. A group of kids also repeat key words and contribute to a better understanding of what is going on onscreen. This DVD mixes animation and live action together successfully to make sure kids can follow the pronunciation but also have fun with its cast of animated characters. The lesson also includes footage of kids doing several pastimes related to the season being discussed which keeps things interesting. For instance, when they talk about fall, they shows kids jumping into piles of leaves. This DVD has a special features video that explains Whistlefritz’s inventive philosophy about immersion and what exactly learning by immersion means. I recommend you watch that before showing kids the DVD. I give French for Kids: Les Saisons an age recommendation of 2 to 8. There is nothing objectionable about this DVD, but I think it is most comprehensible for children at least 2-years-old. I’m not a parent, so that’s your call. The DVD’s length and cheerful atmosphere should keep your child’s attention. I give French for Kids: Les Saisons 4 out of 5 stars. This is an excellent resource for your child to begin to learn some basic French. This DVD is available on Amazon and other places where DVDs are sold. Do check out some of the other titles from its producer, Whistlefritz while you’re at it.